Antoine de Saint-Exupery was one of the most famous pilots and writers of 20th century and today there is a foundation which founded for his name. It is well known and followed by watchlovers; in recent years IWC launched a lot of models to help Antoine de Saint-Exupery’s foundation. The author most recognized with his Le Petite Prince and died when his plane was shot around Marseille during World War II. Lately, IWC has launced a lot of special editions of its Pilot’s watches in memory of the Antoine de Saint-Exupery who played a huge role in the aviation history. Here is, not too long ago the last one of them presented to watchlover’s taste. 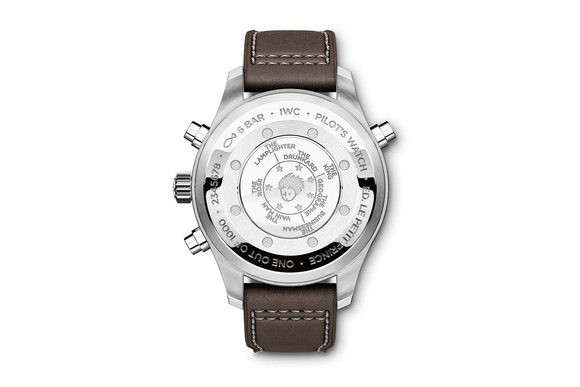 IWC Pilot's Watch Double Chronograph Edition "Le Petit Prince"
In house IWC 79240 caliber offers 44 hours power reserve and features double chronograph. Which means, it gives you the opportunity to keep two different times. There are three sub-dials on the dashy dial of the watch. Running seconds at 9 o’clock, and 30-minute and 12-hour counters at 12 and 6 o’clock, respectively. Seven stars placed at the center of the dial, each representing one of the planets that the Little Prince visited , besides that; It allows you to track week’s seven days. In addition to that at caseback again quoted from the famous book. Seven different stars again patterned on caseback and connected each other via names of people that the Little Prince visited and met on seven different planets. IWC’s Le Petit Prince limited with 1000 pieces and priced at $12,700. We have no doubt that this beautiful watch which decorated with a lot of details from the book will have its buyers in short notice.